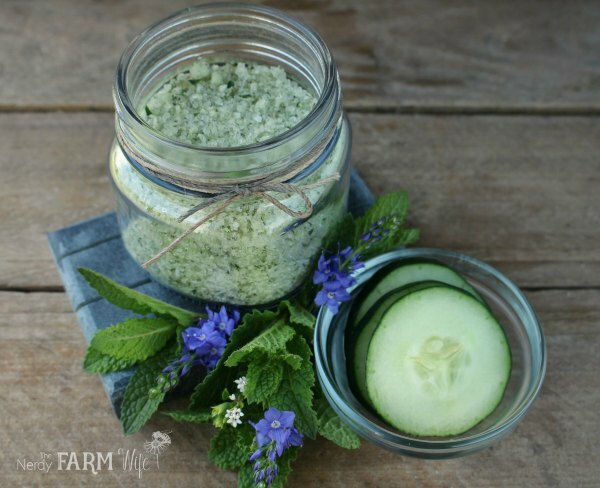 Enjoy these 10 practical ways to use fresh mint from your garden! Mint is easy to grow and helps cool, relieve pain, indigestion, headache & sore muscles. While peppermint and spearmint are most commonly used, if you have other types of mint such as orange, pineapple or chocolate mint, feel free to try them in the ideas below instead. These are super easy to make and look so pretty in summertime beverages! 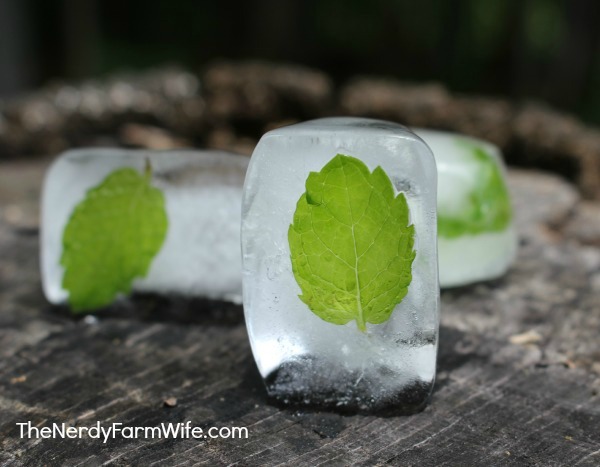 To make, pour a small amount of water in each section of an ice tray and place a mint leaf in each one. Freeze until almost solid to hold the leaf in place, then pour more water in until the tray is filled. Freeze again until solid then remove the cubes and add as a decorative accent to drinks. Store in freezer bags until ready to use. Mint sugar can be used to sprinkle on cookies, muffins or sweet breads. You can use it to sweeten tea or roll grapes and other fruit in it, for an extra sweet snack. My favorite way though, is as a topping for buttery toast, instead of cinnamon and sugar. It’s so yummy! 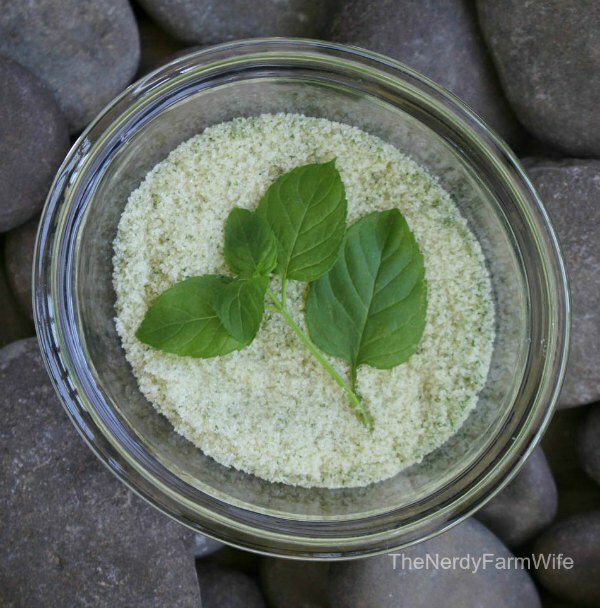 Blend the sugar and mint together in a mini-food processor. Use right away, or for longer storage, spread in a single layer on a cookie sheet and let air dry overnight. Store in a small jar out of sunlight. This is so refreshing on a hot summer day! You can use any type of mint that you have on hand, but my favorite is spearmint. Fill a jar with fresh mint leaves. Pour simmering hot water over them, cover with a saucer and let steep until cool enough to handle. Strain, sweeten to taste and pour over ice cubes. Best enjoyed in a hammock in the shade with a good book! Mint tincture can be used for upset stomach, motion sickness and is said to be an excellent cure for the hiccups! 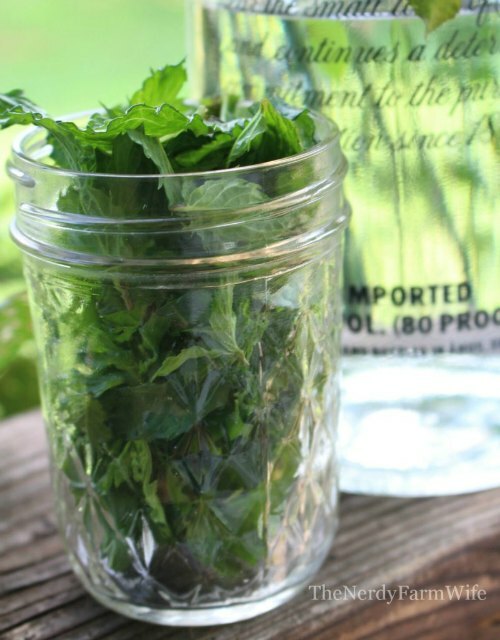 To make: fill a mason jar with fresh mint leaves (jar size depends on how many leaves you’ve gathered up), then cover with an 80 proof or higher alcohol like vodka or brandy. If the lid is metallic, place a layer of plastic wrap between the jar and the lid, to prevent corrosion. Cap and store in a cool, dark place for 2 to 3 weeks before straining, shaking every day or two, as you remember. Start with a dose of a few drops, increasing a bit, if needed. To treat my family, I mix with a spoonful of raw honey. 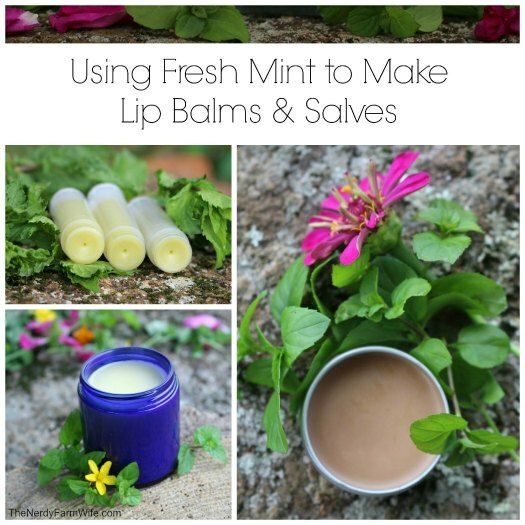 Learn how to turn your mint leaves into two kinds of lip balm and a salve. You can find the full instructions in THIS BLOG POST. This deep cleaning treatment only needs to be done once a month and is most ideal for hair on the oily side. Peppermint is reported to stimulate your scalp, encouraging new hair growth. Add a drop or two of peppermint essential oil for an even more invigorating experience. Massage a small amount into your scalp. Leave on for about two or three minutes then rinse thoroughly. Follow with a rinse of 1 part vinegar and 1 part water. This hair treatment is perishable and should be used within a few hours of mixing together. 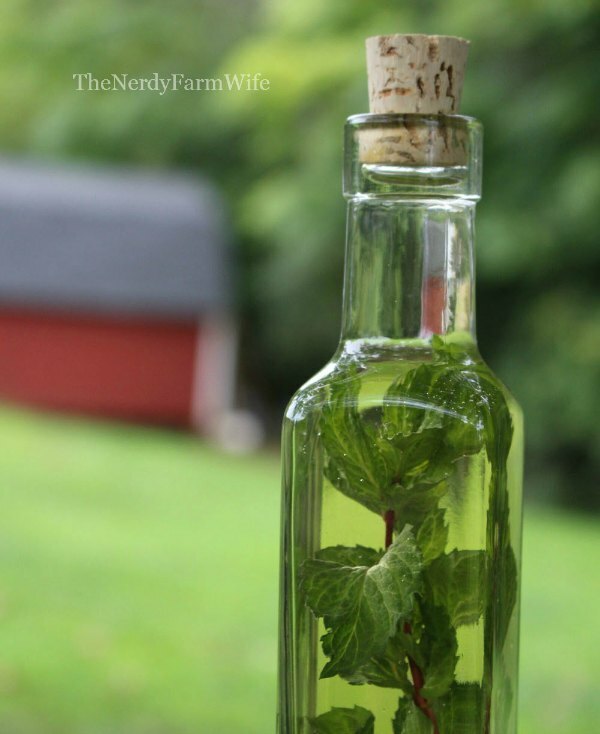 Mint vinegar is super easy to make and comes in quite handy! For windows & counters: Mix one part vinegar with one part water and a pinch of cornstarch (optional). Shake well before using. You can also add mint vinegar to your mop water. For a frugal fabric softener, use 1/4 to 1/2 cup per load of laundry. Dilute with water to make a soothing rinse for an itchy dog. To make: Fill a jar with fresh mint leaves and cover with vinegar. If you’re just making for household use, you can use regular vinegar. If you have culinary plans for it, try white wine vinegar instead. You can also use apple cider vinegar, which is especially nice for a hair rinse. Cover the jar with a layer of plastic wrap then cap. This will keep the vinegar from corroding the metal and ruining your mixture. Set aside for 3 to 4 weeks, shaking occasionally as you remember to. It should smell nice and minty by then, if not, steep a week or two longer. 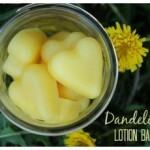 You can also remove the old leaves and add more fresh, for a stronger scent. 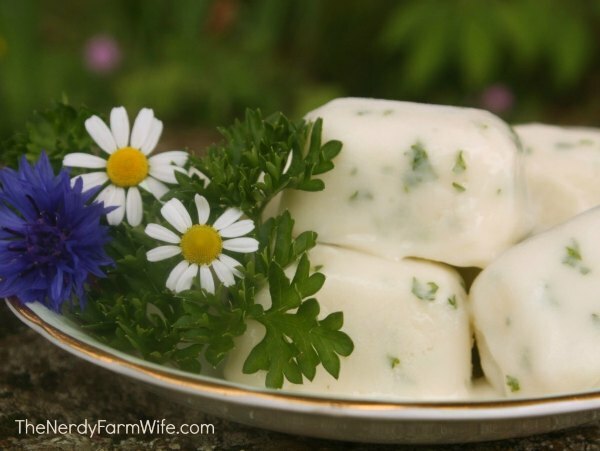 This mint soap recipe is another personal favorite! 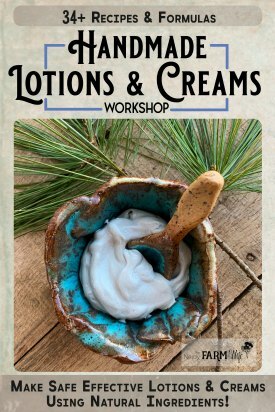 The French green clay helps soothe skin irritations, while the peppermint essential oil energizes and refreshes the senses. 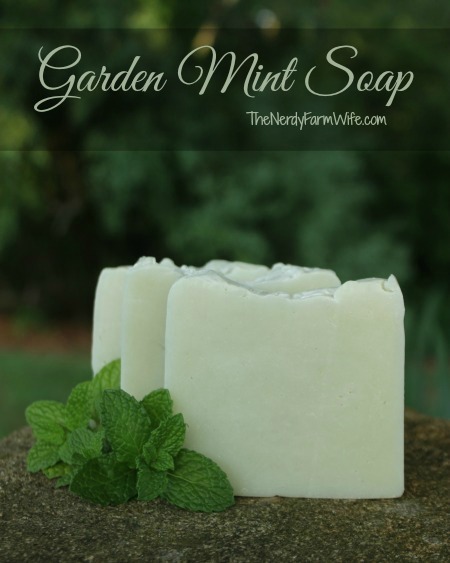 I use fresh mint from my garden to make this, but you can also use dried. 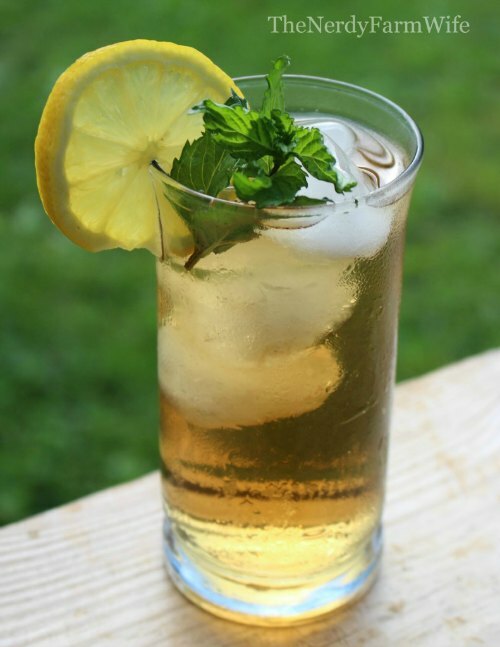 Any type of mint that you have on hand will work in this recipe: peppermint, spearmint, pineapple mint, apple mint, orange mint and so forth. When including herbal teas in soap, make sure that you don’t steep for too long as a strong tea can discolor soap. Peppermint – which helps with intestinal gas, colic and motion sickness, plus it’s a great breath freshener. Parsley leaves – which are full of protein, vitamins and other nutrients. It’s also an excellent digestive aid, is antimicrobial and helps reduce arthritic inflammation. You can find the full recipe and how to make HERE. 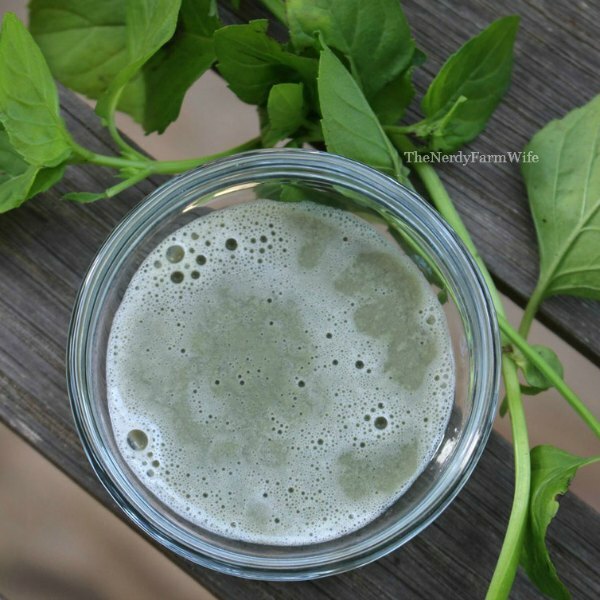 Did you enjoy this post on 10 ways to use fresh mint from your garden? 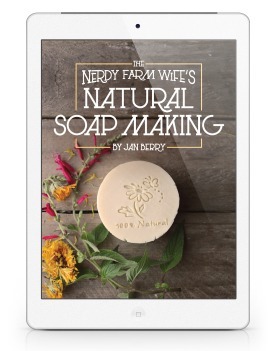 If so, be sure to sign up HERE for my newsletter, so you can get my latest soap ideas, herbal projects and other DIY recipes sent straight to your inbox each month! Tagged mint. Bookmark the permalink. Aw, thank you Cecelia – you just completely made my day! :) Thanks for taking the time to say that – it means a lot! Love all these ideas! Of all my herbs, mint is the one that exploded this year in an unbelievable way, especially the orange mint. Will try some of these ideas! Mmm! Those look great. I have plenty of mint, plus some orange mint, that I need to harvest pretty soon. Guess I’ve got something to do with them now! I had no idea orange mint even existed. I’ll have to add it to my shopping list! I didn’t know orange mint existed either. Great tips, thanks! I also like to make mint simple syrup to use in various cocktails, unsweetened ice tea, and homemade hot cocoa. Just heat one cup of water with one cup of sugar until the sugar is melted. Add a handful of mint leaves (I like to tear them into smaller pieces to get more of the flavor) and steep for several hours, then strain and store in a glass jar in the fridge. Jan – can you use the mint even if it’s gone to flower? The bees have been loving it. Just wanted to make sure it was still okay for all these awesome ideas. I love your site and am always look forward to your newsletter emails. Thank you so much for your blog, your willingness to help others. and your AWESOME ebooks!!! So glad I found your site. I need to say that I love all your ideas and your page. Thank you for all the info that you give us. I have dried some and crushed it up like a power its great for sugars and teas a bit strong have to watch how much you use. I just had so much of it. Great stuff. I can’t wait to try some of them! Mint is one of my favorites too. Glad you liked the ideas! I am harvesting my mint tomorrow as there is frost in the forecast NOOOOOO! My question is: How long do you think mint syrup will last in the fridge?? A week, a month? Also, I am going to try out your mint tincture recipe, only I have a HUGE patch of oregano, so I am going to try making a Oregano/mint tincture for cold and flu season. Hope it works out, thanks for the inspiration Jan! Just stumbled upon this site a couple hours ago and can’t seem to leave. It’s wonderful, thank you so much. Yum, those do sound amazing! :) Thank you for sharing and I’m happy to hear you like the site! just got a bag of Chcolate mint and wanted to know if I can make a tincture? Hi Cheryl! Yes, you can do any of these mint projects with any type of mint you have on hand: peppermint, spearmint, chocolate mint, orange mint, pineapple mint and so forth. The flavors might be slightly altered due to type, but they share similar benefits. Those are great uses for your mint! The tincture is good for treating upset stomach, motion sickness, and nausea. You can also try rubbing it externally on pressure points & your temples for headache & you can dilute it in water and use as a mouthwash or gargle when you have a sore throat. Love, love your recipes! 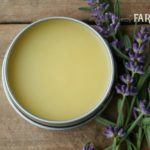 I made Peppermint Lip Balm and Peppermint Salve today. Still waiting for the salve to set up, but the lip balm came out great! I’m glad that I added some drops of peppermint essential oil to it. That’s great – I’m glad they turned out well for you! In the summer, you might want to add a smidge more beeswax if they take too long to set up or don’t feel firm enough, since the heat can make items softer. Since you know your mint, have you ever heard of mint warding of mice? Hi Robin! I’ve heard that mint repels mice too. However, when I was in elementary school, we lived in a very old farmhouse with mice galore. I loved peppermint chewing gum and always had some in my room. The mice would come in and eat it, so I’ve always doubted a little bit, how much mint really repels them. It might be in certain high amounts that it will though? I wish I could be more help and I hope you find a good remedy for them! these recipes are awesome I cant wait to try them all. the question I have for you is, how do I dry the mint? can I use everclear instead of vodka and brandy? Hi Joni, You sure can! In fact, I think it’s recommended by some herbalists, but I don’t have access to it in my area. I loved your recipes and plan to try them soon. I do have a question though. How long would the mint vinegar be good for? Hi Nichole! Infused vinegar should probably stay good at least 9 months to a year, and possibly even longer. Just be sure to keep any plant matter completely covered with vinegar while infusing and strain before storing long term. I’ve got 4 mint plants out on the deck. I’ve noticed that we are getting fewer creepy crawlers and fearless flying blood suckers since I’ve put them in. This their second year, and have to re-pot them ’cause they really grow! Am thinking to add some mint to my citronella candles. That should keep the most daring bugs away! Hi Cathy, That sounds like a great idea! Plus, I bet it will smell great too! I am happy to have found your site. I’m a long time make-from-scratch person. Now I’ve lost my job due to injury, I’m having to learn about growing my from-scratch and how to make the most of them. Such as an abundance of dill, mint, coriander (you call it cilantro I think) and pumpkins etc. I have always made pickles, chutneys and freeze dehydrate bottle and bake. Your site helps me go that one step further. Hi Rosie! I’m so sorry to hear about your job loss and injury. I know that’s a difficult situation, but it’s good to hear that you’re being creative with what you have and making things from scratch! My daughter gave me a planter with 4 varities of mint for Mothers Day. Have used them in iced tea, hot tea and fruit salads. 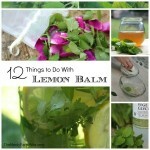 Yhey have really taken off so i my search for uses of mint stumbled upon your blog. Thank you for all suggestions, many of which I will try. I did enjoy your post ten things to do with mint as a matter of fact I always enjoy your posts. 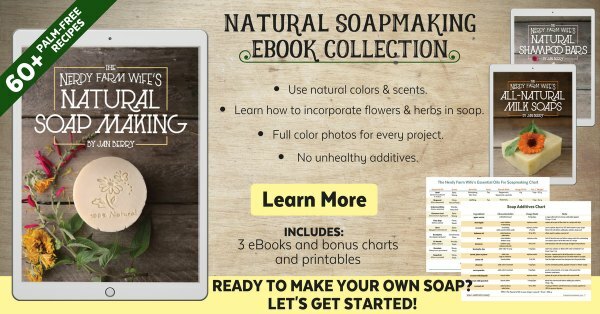 Since I bought your Ebook things to do with roses I am hooked on this site. Thank you for all this wonderful info and God bless! I am making that spearmint sugar now, and my kitchen smells amazing! I cannot wait to try it, honestly, but I will. I am sure it will be delicious in all sorts of things, so I doubled it.